Welcoming Kelsey Long to the EA team!! Long before Kelsey took to the air, she was a hula hoop dancer. 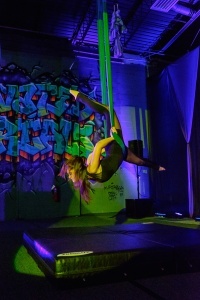 She has been involved with the flow and movement arts for nearly a decade, and had her first experience with the aerial arts at Kinetic Fire. She regularly travels to teach and attend flow festivals. Kelsey began her aerial journey 6 years ago, and has been teaching various forms of aerial for 3. She obtained her Lyra certification through Aradia Fitness, in April of 2016. Kelsey has trained with aerialists from all over, and believes that everyone has something to share! We are thrilled to have Kelsey be a part of our team here at EA and we hope that you will all give her a warm welcome next time you’re in class!